Russell, 51, started training in 1995 and saddled a winner with her first ever runner, Fiveleigh Builds, at Perth, just 30 minutes’ away up the M90, in September of that year. She later recalled, “After about ten years finding my way in the sport and with fourteen horses in the yard, I met Scu and he moved up here and joined me.” “Scu”, of course, is Peter Scudamore MBE, former eight-time National Hunt Champion Jockey, who is her assistant trainer and partner. All in all, Russell has saddled over 600 winners, including nine at graded level, and she and Scudamore have formed the most successful partnership in the history of National Hunt racing north of the border. 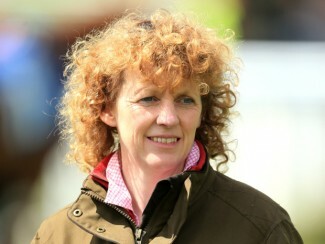 Russell trained her first winner at the Cheltenham Festival in 2012, when Brindisi Breeze – described by his trainer as “a nutter” – stayed on well under Campbell Gillies to win the Albert Bartlett Novices’ Hurdle by 2 lengths from Boston Bob. Tragically, just over three months later, both horse and jockey were dead. Brindisi Breeze jumped out of his paddock and was killed instantly after colliding with a tanker and Campbell Gillies died after an accident while on holiday in Corfu, the day before his 22nd birthday.